Join the discussion on our forums! Come discuss Defile over in our dedicated Defile discussion topic. They had to nerf Dreadsteed because the deathrattle triggers before Defile is cast again so the Grim Patrons would go infinite as well. Only going to show the health values of the Grim Patrons. If you are going to argue the stack of effects then consider Dreadsteed and its nerf. If Dreadsteed's deathrattle will trigger and resolve before the next Defile is cast, then Grim Patron's effects and deaths will resolve before the next Defile will cast. Remember Grim Patrons will spawn until the board is full even if 1 Grim Patron is in the process of dying, so the one that is dying will always leave a spot open for the next to spawn during the next wave of damage. Even a board that starts full of Grim Patrons would still go infinite as long as one of those patrons was 1 health and another 2 and a third 3. Those are the only required conditions for this to go infinite. There may be some deathrattle that I am unaware of that could stop this, but not even Tentacle of N'Zoth should affect the combo. If control warlock will be viable again - this card might be extremely powerful. "Deathrattle: At the end of the turn, summon a Dreadsteed." I understand that, the point is that the nerf is stupid and the card could easily be made to not have a broken interaction. IMO it makes more sense in most cases to design cards around the ones that already exist instead of changing them to make a card work, which could be easily done by making the card work like the idea I posted. Oh my goodness this card is insane. As a dedicated control player with an emphasis in Renolock this makes me so happy. Standard Kazakus lock could even be a thing if they give any decent healing. This set looks promising. I was really starting to get turned off of hs after Stonehill defender into multiple Sunkeeper Tarims happened to me like 200 times. I hate that blizzard is ruining dreadsteed like this. I have a pritty good Dreadsteed deck atm and this change might destroy all the good synergies dreadsteed has going for it. But because just crying about it is useless i came up with an other way to balance/solve this problem. Make Dreadsteed a 1/2 minion instead and keep the deathrattle as it is. The one extra HP doesn't matter on a minion like dreadsteed since all it is supposed to do is die. 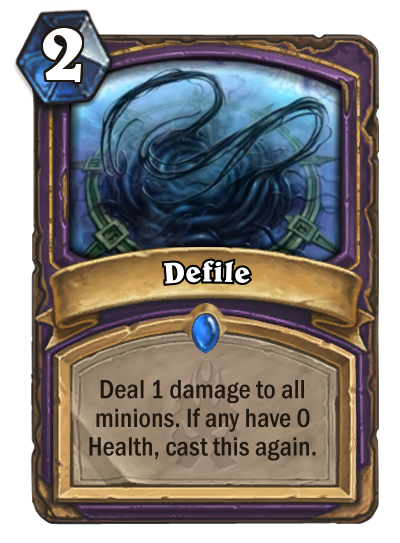 This way Defile can't kill the Dreadsteeds over and over even though it still is a very powerfull combo off its own. Plz let me know what you think and hopefully we might change Blizzards mind! Deathrattles DO trigger after it has ended actually but it gets casted again. Recast sequence starts after the deathrattles so it works as intended. That is a reasonable change. I still think they can code it so that Deathrattles only trigger when the spell has stopped and will not be casted again. That should be easy enough I think. That wording indicates that it should be recasted after the original cast. It will be ended and recasted. Dreadsteed would break the game and Blizzard, unlike other broken interactions and bugs, toke an action about it before the release and changed Dreadsteed instead. 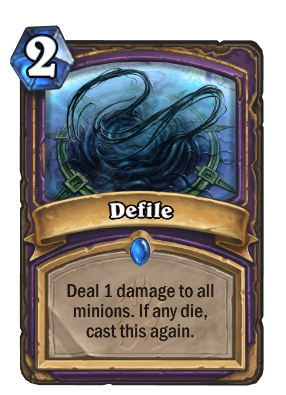 Also, if deathrattles would activate later, that would've made Defile weaker since you want to deal damage to minions generated by deathrattles.